September 20, 2016|Posted in: Happy, Healthy, Smart Kids! 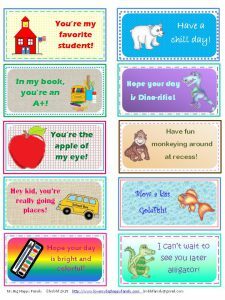 Lunchbox Notes are a great way for parents to encourage kids while they’re at school! Just slip one into your child’s lunchbox to remind them “think positive thoughts,” “always do your best,” “I love you!” and other fun and important messages! Here’s a free copy of some Lunchbox Notes from Love My Big Happy Family. Just print, cut and slip in your student’s lunchbox! Get your free copy of Lunchbox Notes here.